So I was a big user of the journal layout in Phanfare. My first sub album in each years annual album was my blog, with a section for each month. Sometimes it would be all text, sometimes there would be images as well and the images would appear within the text - usually at Phanfares own discretion as to actual location within the text - but playing around with paragraph breaks could generally ensure my image stayed with the text it was associated with. So having a bit of a play today with the actual appearance of my site, folders, galleries etc. Finding it all pretty confusing to be honest but just taking it step by step. Is my best option for my blogs to select that specific gallery and select customise. Then "Make this gallery custom" ? At some point while playing I have selected Journal layout but for the life of me now I cannot see where I did that. But it did make all my text appear - but all the images are down the very bottom in a long vertical line that means nothing in the scheme of the layout. After much clicking again I cannot see where on earth I selected the journal layout. I can see an option for a side bar - would that be a better place to put the images so they are along side my text ? (And how ?). I added a side bar and tried to click on it to do something but nothing happens. And - if I select to "Make this gallery custom" and I have done that for say January 2017 (within the gallery titled 2017 Blog) - does it automatically carry my choices through to my other months for 2017 that are currently sub galleries. AND - is there a way to then somehow save all my options for that blog display so I can then go back into each year and fix my other blog folders or am I stuck doing 12 years worth of blogs in monthly albums painstakingly one by one bit by bit ? I guess I mean - can I create a template for my blogs and then go into each one and just select the name of my template - or something like that ? I feel like I (and others) are going to be asking a lot of questions simply due to adapting from Phanfare language to SmugMug language - but also to me it feels like Smug is a lot more technical and designed to be used by people who speak in techo html language - and many of us dont !! SmugMug: small thumbnails on the left with the selected photo shown large on the right. Titles and captions displayed underneath. Collage Landscape: a collage or mosaic of photos with the title and 2 lines of caption shown over the photo. Every gallery also has a Gallery Description. 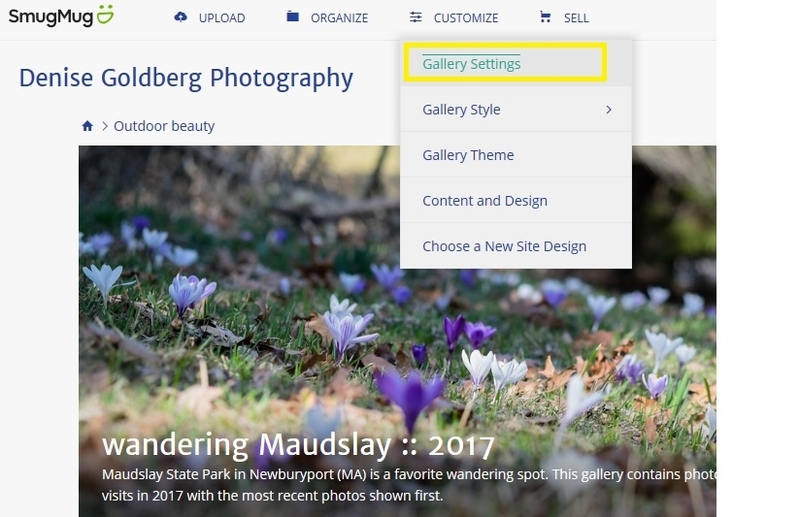 The Gallery Name and Gallery Description are displayed at at the top of the gallery (in the "header" area), along with slideshow (if turned on), download buttons (if turned on), and buy buttons (if turned on). For Carousel and Thumbnail gallery styles, an option Cover Image can be set in the Gallery Settings that displays a full width photo at the top of the gallery. It sounds like your "blog", or the story, was written in the Gallery Description. This will always be above the photos. Typically you would tell the story, or blog, by leaving captions on the photos and using each photo to tell the story. In the Customizer (Customize, then Content and Design) you can choose to change the layout and settings of various content blocks, or widgets. If you are on "All Galleries" and add Content Blocks, every single gallery will have that same content block. Setting "Just this Gallery" will allow you to add Content Blocks to just that gallery. Just like the name implies, it only adds those changes/content blocks to the specific gallery. Other galleries in the folder are not impacted / will not get the changes. Folders are containers, just like on your computer. They can contain sub-folders, galleries, or pages. They cannot contain photos. Galleries are where photos live. It's always where you put your photos and knowing that your photos always live in galleries lets your photos shine and be optimized in ways that wouldn't happen if they were mixed with other items. Pages: Think of a "page" as any webpage that can have anything you want on it. Some people use Pages to make blogs, other people use pages for an "About Me" page, while others show off Workshops. The options are limitless. A page can be made up of any number of content blocks. Many SmugMuggers will create a "blog" by combining a Text Content Block with Single Photo or Multiple Photos content blocks. You can move the blocks around the screen, set their widths, etc. A beautiful example of a blog built this way can be found here. Alternatively, and my preferred method, is to use the photos themselves to tell the story, by embedding them with captions that tell the progression of the story. This is the best way to ensure the writing matches the photos, and it also means if the photo is viewed by itself, the viewer will always know what the photo is about. SmugMug was built such that no HTML was needed -- though we certainly have power users (whom you'll find here on dgrin) who want the advanced customization features. We've setup tools to satisfy both the more casual customer, who wants a visual widget system, with those that want complete control via code (by allowing HTML/CSS customizations). We also have a few specifically scheduled for Phanfare customers to get started with SmugMug and you can find details about those in your email. After saving the journal view so that I can view it properly - at the bottom of my text I can see huge buttons to "download" or "slideshow". Obviously I wouldnt want this on a blog - but clicking everywhere I can find any options to remove these. Then under each image (which I havent worked out how to move where I want them to move to) there are buttons for buying, info, maps etc etc - but no where I am clicking is showing me how to get rid of all those things. The download and slideshow buttons are enabled in gallery settings, as are the buttons for buy and map. Download is always enabled for you as the gallery owner (when you are logged in). Help page on downloads - http://help.smugmug.com/customer/portal/articles/93266-can-i-download-photos-from-my-smugmug-site-to-print-myself-. Download button for visitors is enabled on PHOTO PROTECTION tab of gallery settings. Slideshow button is enabled on APPEARANCE tab of gallery settings. Buying, Info, and Map ares enabled on SHOPPING tab. 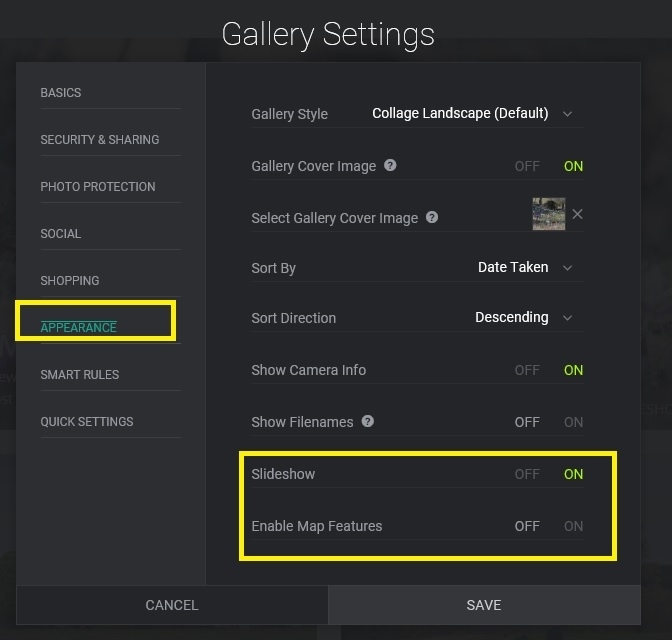 In case you haven't been there before, settings can be adjusted on individual galleries or on sets of galleries. For bulk changes, see help page http://help.smugmug.com/customer/portal/articles/1240194-how-do-i-change-settings-for-multiple-galleries-at-once-. Just reading this on my phone so will need to reread on my desktop so I can see it along side my site and opening the links you have both provided as I go. Note that I haven't personally put or written anything anywhere yet !! I'm 100% reliant on how Smug has converted/migrated all my content over from Phanfare. So I haven't had any idea of where Smug has put all my actual text - being my blog itself. Until I actually selected the Journal view I thought all my text had been missing as when it was in the other views everything was totally blank. Which left me panicking. In my case my blogs have nothing to do with photos telling a story. That was not what I have used them for over the past 10-12 years. Only occasionally do I add a photo. They are predominantly text. It's a personal blog for my family who are not social media users who simply want to know about my life. When I am on my main computer in the morning I will look at the link you have added where someone has used the Page option for a blog. Can I have multiple pages ? ie in each of my annual folders a Page as my blog for that year ? Can I convert an existing "gallery" to a "page" ? Or am I going to have to do a serious load of cutting and pasting to restore over a decades worth of blog entries (I guess I should probably do that into Word anyway rather than risk losing it all again). Will read the rest that you both posted in the morning. Cheers. You can have multiple pages in a folder. You can't convert a gallery to a page. In case you haven't seen it, see https://school.smugmug.com/SmugMug-Tips/How-to-Make-a-Photo-Blog. Have had a better read on the big screen and checked the links. I think we have differing ideas of what I am meaning by a blog and how I utilised Phanfare's Journal view. Photos were not necessary nor a predominant part of what it was for - the Phanfare journal view didnt require a photo anywhere. The text was the important part. On the odd occasion I added an image it was a secondary item not the main thing in the blog. Still trying to work out whether SmugMugs Journal view will work - if I take into account where you have said that all the text from Phanfare has carried over to the "gallery description". If I locate where all that text is hiding and past it into an actual text box in Journal view it would appear this still isnt going to work because SmugMugs journal view is reliant on an image existing in the first place. I might sit and have a play with a Page instead and see if that will work. It will mean a heck of a lot of copying and pasting to restore over a decades worth of blog entries - but as long as it turns out to be visible and readable thats the important thing. And good to see Denise that I can have multiple Pages - this may be the solution! I asked a friend to view my SmugMug URL on her phone last night to tell me what she can see at present just so I can assure myself all my albums (sorry - folders/galleries) are definitely private for now. She said she gets a "URL not found" screen. I was assuming she would at least see my cover photo and site name - but just not be able to click on any folders. I feel like I am missing a step here somewhere. I do appreciate the help. I have read so many tutorial pages and watched the You Tube videos but a) the tutorial pages have some step by steps - but they lack actual examples/screenshots of finished products so you can see if its what you are trying to achieve, and b) the videos are predominantly designed for people opening a new gallery etc from scratch - not starting with 100,000 migrated images and trying to rejig everything - so its fast becoming overwhelming. It gives a screen shot of the navigation options - then it lists them and gives a really basic description of what they are - but it doesnt actually go into any further detail or screenshots of what each option is and what it looks like. So its left as a mystery. Further down the same page under the design heading it describes basically what a separator and a spacer is - but again no screenshots showing them as examples. When I tried to add both the the journal view I was playing with last night they just appeared to be huge boxes when I was picturing that a separator might hopefully just be a divider line or something like that. So While I love that there are plenty of tutorials and help guides - some of them do leave a lot to the imagination for the beginner. Sorry - longer reply than I anticipated! If I am going to have to do a lot of copying and pasting between that galleries that my phanfare journals were migrated to - and the new Page or Pages I build - is it possible to have Smugmug open in multiple browser tabs ? So one tab is the organiser and another is the customiser etc ? Sorry Karina, I must apologize that I'm not super familiar with how Phanfare worked. When you mentioned you used their Journal view, I assumed it was some a gallery style that allowed you to mix text and photos, similar to a blog. I saw a few example journals from PF that were setup this way. When we migrated the journals from PF to SM, we imported the text as a "Gallery Description". If most of your journals don't have photos, then it doesn't really matter and you can probably just leave them all as Galleries and not bother copy/pasting. A "Gallery Style" is just simple a graphical way to display images in a gallery. They can be displayed in different ways: as a grid (thumbnail), as a mosaic (collage), as a vertical list (journal), etc. Every Gallery has a description, which is always displayed at the top, regardless of whether or not its set to "Journal Style". So I wouldn't get too hung up on the journal style thing, it just means that if you did have photos mixed with your PF Journal, they'll be displayed at the bottom of the text in a vertical fashion. Going forward it may be better to create your journal entries by creating a SmugMug "Page", using a "Text Content Block". Am I right in that these tabs are when I am in the "organiser" section ? not in the "customise" section ? 1) If you're in the Organizer, it lives in the toolbar under "Settings" (with a gear icon). 2) Outside of the Organizer, under "Customize" and then "Gallery Settings". If you turn off the download buttons, slideshow, and shopping cart, those buttons will disappear. Note that the buy button will always appear for you, when you're logged in as the owner, since you're allowed to purchase prints of your photos even if the cart is off. You can use an "Incognito Window" (Chrome) or a "Private Window" (Safari) to view your site as if you were logged out. Yep - that should be fine! I constantly use multiple tabs. Thank you on all multiple points ! And yeay re multiple tabs as I feel I have a lot of work to do! Those settings are in the Gallery Settings. For an individual gallery they are not in organizer, are available from customize, and they are only available to you when you are logged on to your account. 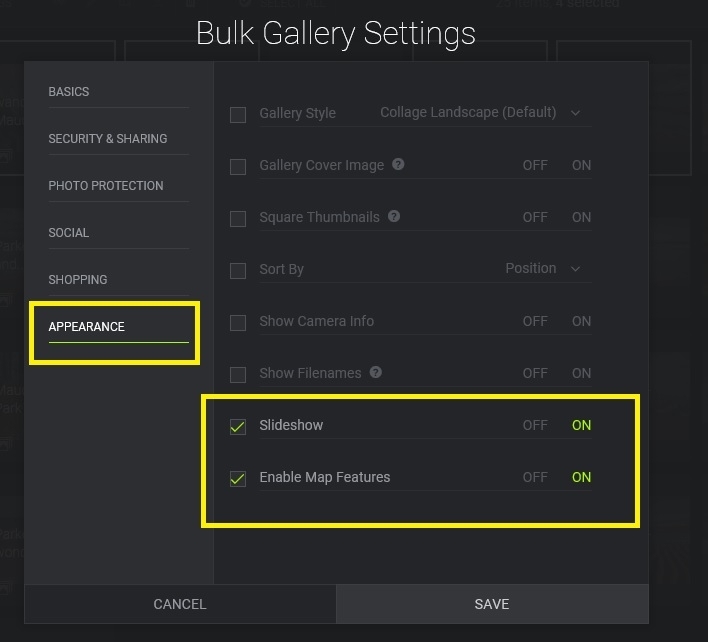 It is possible to change the settings for multiple galleries at once by using Bulk Settings in Organizer. multi-select the galleries you want to change. In my example, I have clicked on a folder on the left side of the organizer, then clicked on 4 galleries within that folder to select them. Ohh interesting re the ability to do bulk settings - thanks for that tip!